December 24, 2014, 11:07 AM · Happy holidays to all! 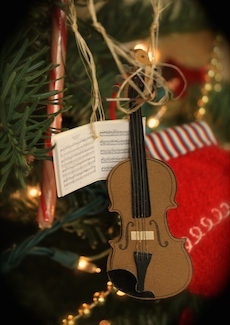 Since we're blasted with holiday music everywhere at this time of year, I thought I'd start a holiday play list just for us violin fans, with some good string-playing. I've tried to include a range of styles, but as always, I need your help! Please add your favorites to this list, and link to a video if you can. Hope you enjoy the season! Lindsey Stirling has put together a 12-video playlist on Youtube, and below is all of it. Whether it's up your alley or not, she really knows how to create a sound-sight world that people enjoy visiting! And something to make you smile: this quartet is busking, in the NYC subway system, just playing Brandenburg 3, and around 2:05 a group of dancers joins. It made me smile! Please add your holiday favorites in the comments section below! December 24, 2014 at 11:14 PM · I have enjoyed watching and listening to these videos. Many thanks. Here is one of my favorited, and it was hard to pick, which always brings a smile to my face. From how the musicians greet each other, the look on the adults faces bringing back memories and forming new ones, and the reactions and looks on the kids faces. For me, the best reaction, will always be of the girl who climbs higher than everyone around her to get as close as possible to the music. The look of wonder and amazement will stay with me. Enjoy my selection. December 27, 2014 at 07:48 PM · I will check out that Nutcracker arrangement! Okay it looks cool, but I actually don't want to download it and print out that many pages. Wishing I could just buy it printed!